It’s taken a few years, but the book Australia’s Nickel Adventure is hot off the press and back from the printers. 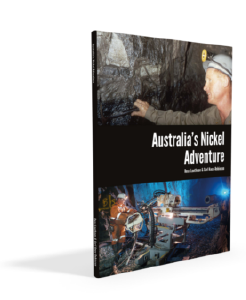 At 188 pages, including over 170 photos and maps, Australia’s Nickel Adventure covers the history of nickel exploration and mining over the past 50 years. You can purchase your copy of the book today for only $38+p&h. Click here to visit our store. Magnificent from cover to cover. Congratulations on capturing the true spirit of those great – and continuing – years. I really enjoyed the book – an outstanding effort on your part, and a real record of those amazing times. So many memories on every page! I’m sure it’s a best-seller. I was very impressed with the read. Thank you on a great book and some great history of the mining industry. Sean Flynn, Relation to Jack Lunnon of Kambalda and WMC fame. Many who were born in the previous century will remember the frenetic Poseidon nickel boom when junior stock prices would soar on a questionable rumour or on the basis a company had pegged ground near a discovery. Australia’s nickel story actually began more than a decade before that crazy stock market phase and that is one of the starting points in “Australia’s Nickel Adventure” produced by Silver Budgie Pty Ltd to mark the story of Australia’s ongoing role as a great global nickel producers. It was a story that really went public at the end of the 1960s when Western Mining Corporation (later WMC Resources) discovered sulphide nickel at Kambalda. The fortunes of Australia’s performance as a producer of both sulphide and lateritic nickel has waxed and waned with the nickel markets but its role in the Australian economy has often been under-stated. A lot of remarkable people and innovative companies have worked in this sector and this is recorded in this book. It is a history worth recording with all its excitement and disappointment, colourful stories, and engineering and technological advancements. This book has been produced with the enthusiastic support of people who have, or are still, working in the nickel exploration, mining and processing industry. Historical and recent data, as well as photographs and memorabilia have been made readily available. Also supporting this book have been journalists and authors of earlier books and works that have related to the nickel industry. The book recounts the pre-Kambalda era for nickel, the great Kambalda discoveries and development and the first days of lateritic mining and processing at Greenvale in Queensland. Then there were the new mines of the nickel boom outside of Kambalda – at Scotia, Nepean and Carr Boyd to name a few, followed by the sulphide nickel and laterite nickel developments at or near Ravensthorpe. Jubilee Mines helped liven the picture with its high grade Cosmos discovery in the late 1990s while Mining Project Investors found the spectacular high-grade Silver Swan deposit closer to Kalgoorlie. When WMC fell out of love with Kambalda, this created a new era that allowed smaller fish (often using the expertise of Kambalda operators) to explore, to probe deeper and create a new life. This included Mincor Resources, Independence Group and Panoramic Resources. Meanwhile, a new life was being created at Forrestania, when Western Areas NL took over the mothballed operations of the Outokumpu group and also made enviable discoveries including Spotted Quoll. A modern nickel boom came with Sirius Resources made the big nickel-copper discovery in a remote region well east of Norseman that showed the earlier concepts of Canadian style nickel-copper deposits were a reality in the Fraser Range. That company was then acquired by Independence Group, and the old team was given a life boat to explore its gold and other metal targets south of Kambalda and to start a quest in Scandinavia. Nova and its related deposits were being commissioned in 2017 and were seen by analysts through the nickel-copper association as able to withstand any new lows in the nickel price. The book also covers some of the important past and current exploration programmes by others. Ross Louthean has spent most of his working life as a resources writer and developed several mining publishing groups including National Miner for Hancock Prospecting, Lodestone Press, Resource Information Unit and Paydirt Media. There were many mining conferences developed, many of which operate today, including the Australian Nickel Conference. Louthean worked as a columnist for overseas publications including Mining Journal and Northern Miner. While working for the ABC News in the 1960s-early 1970s he became regional journalist in Kalgoorlie and witnessed the development of Kambalda. In 1996 with Tim Green in London and David Duval in Vancouver he co-authored “New Frontiers in Diamonds.” Louthean now edits the website NZResources.com in partnership with Carl Knox-Robinson. Carl Knox-Robinson is a geoscientist and an IT specialist who has worked at universities, consulted to the mining and internet industries and builds and manages fully customised internet/intranet and IOT software solutions.